Hughton on Carroll, relegation, and the rising bairns. | NUFC Blog. Hughton on Carroll, relegation, and the rising bairns. Chris Hughton has been speaking about Andy Carroll, relegation, and the chances this has given to Newcastle United’s younger and more inexperienced players in the wake of the great exodus of 2009. Hughton concentrated mostly on Gateshead hitman, Carroll. The 20 year old is now one of the more ‘experienced’ of the younger players, having made a total of 29 senior appearences (not including a loan spell at Preston) for the club until the end of last season, since his first team debut in a UEFA cup tie with Palermo. Carroll looks set to double that appearence total this season alone, so long as he doesn’t get a serious knock. “I think it’s fair to say Andy Carroll would not have got this chance this season if we had still been in the Premier League. “He wouldn’t have played as many games, that’s for sure, so the drop down has been good for him on a personal level, although I’m sure he never wanted to see the club get relegated. “He is one of the young players we have at this football club who have benefited from the difficult circumstances we found ourselves in after relegation. I said that in pre-season. We had a group of youngsters who had been on the fringe of the first-team squad and they would be expected to compete for a place in the side this season because we don’t have as many senior players available. “I said it was up them if they took it and Andy has taken his chance without a doubt. I’ve been delighted with him – and he is developing quickly. “It’s a similar situation with Nile Ranger, Tamas Kadar, Kazenga LuaLua, Ben Tozer and Ryan Donaldson, but it’s important to remember that Andy was probably a little bit ahead of them. A young but experienced Magpie. “He made his debut when Glenn Roeder was manager and he has been in and around the first team since a very young age. 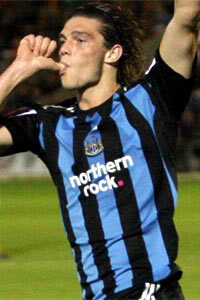 Indeed, when Carroll made his aforementioned debut against Palermo, he was the youngest ever player to represent Newcastle United in Europe at 17 years and 300 days old. This was also the match when another Newcastle hopeful, goalkeeper Tim Krul, made a very impressive debut between the posts. Long term development: Operation goals. “What I want to see from him is continued development. He has done very well, but there is room for improvement in every single aspect of his game. “He has got to score more goals and he has got to get himself into goalscoring positions more often. That’s obvious. Every striker will look back on a season and will be judged on how many goals they have scored. “I think he is terrific in the air and we have seen that this season at both ends of the pitch, but he should be aiming to constantly improve his all-round game. Hmm. Sounds about right, Chris. Hughton vows to batter Swans, but Sho will probably be a no-sho. Llambias’ and Pardew’s Carroll deception unravelled in bar rant? Great in the air, and can’t half shoot when he connects properly. But awkward, not quick enough and doesn’t make the ball stick. We can but hope, although I still think he’d be punching above his weight in the top flight. Mind you, you can say that about plenty of players that have made a decent career out of it. I suppose it depends what end of the table his team was (assuming it might not necessarily be us, if and when he’s back up there). Basically, I’m going to keep quietly slating him, particularly at games because every time I do, he shoves it right up me by smashing the ball into the net. Can’t argue with that. Reet, off out for a run. Enjoy the banter lads and ladies. Carroll will be much better than Kevin Davies imo. He has made a canny living from top flight football. He really is brilliant in the air and is a decent finisher. Although we really have to remember that he is still only 20 and will be really inconsistant for a while yet. His hold up play, finishin and decision making will improve every season. IMO he will be areally good PL player. What does Chris mean Andy would not have got first team opportunities if we had stayed in the premier league. Probably more of the inefective Viduka surely not. Chris claims he has given the younger players a chance but I would disagree he has only played them when forced to. Go back to WBA game we got a point to through the brialliance of Krul but did he get picked for the next game. No. Harper good keeper that he is got his place back. And don’t get me going on how Zhurab and Danny Simpson were chosen at centre back before Kadar. Andy Carroll has missed the target the most in the championship this season. Shame that the real blogs closing down, cant even comment because someones fcuked the last article up. Guess i’ll have to make do with this substandard blog. Stardust, what do you think about this “Yes we can!” thing? i was talking to young simpson last night and told me the reason ranger didn’t start the last game was that he was still a bit sore after having genital warts removed….but he will definetly start the next game..people will probably think i’m bullshitting but it’s the truth. This ‘blog will be the biggest to come I reckon. Really liking the spruced up theme. One of you know how to make WordPress themes from scratch if I’m to believe correctly? Aye but don’t forget we have a much longer season with 46 games. If players get flogged like a dead horse they don’t perform as well and they’re much more likely to get injured too. Managers have to shepherd their their squads through a tough, gruelling season. Lets see him him get faded in gently, like Moyes did with Rooney and see if he gets a bigger role later in the season. I’d like to see more of Ranger too, but I like the way Hughton’s playing the long game and guiding his whole squad carefully through the season. It shows he can think like a manager. It’s a very complex job and they have alot to things to balance. Biggest heap of opportunist bull I have seen in my lifetime Worky. When you raise funds for any investment you need to have full financial forecasts up front. The team heading it up went on TV saying that they had pledges for 20m and now needed to do financials – it was blatant opportunism – a disgrace of announcement. No doubt seized upon by the Corporate Financiers (who will be paid even if the bid fails). Every NUST member should be sitting bolt upright thinking – they are asking for people to invest 20k from their pensions and they havent even got financials. Its a disgrace and will lead to nothing but heartache and a few hundred gullible fools being ripped off. Its almost a public crime. Frank and to the point. Nee messing about with diplomacy. R.I.P. .COM – EDS TOOK IT DOWN! It does seem a little cobbled together Stardust but given the nature of it, i.e. this is an emotional investment, rather than just purely a financial investment, it’s perhaps more understandable why it’s happened that way? he says whilst grinning like a cheshire cat…. Gutted that Ed had to put up with sh*te like that on the final post. Some decent tributes though amongst it, and well-deserved. Didn’t always agree with his opinion or his penchant for so many articles but he was passionate, committed and seemed like a really good bloke. BBM – you cant play with peoples financial future without full financials BUT in my opinion the 20m was an outright lie. Not one person would invest without knowing what they were getting into unless they were philanthropists – but the average NUFC fan is not wealthy enough to give that amount of money away – sorry – invest it. I believe they misrepresented emails of the NUST morons – and span them into pledges. how ironic that one of his tormentors (batty) gets the last post..
OMG cant believe its gone! visited that site nearly everyday for 2 year, never read an article well maybe 1 or 2 but juat enjoyed the general chat. how depressing! Stardust, I thinking about it because it didn’t seem right to me and I wrote a comment about it yesterday. Of course, what you’re saying is true, but there are other aspects that also make it look like two trains heading for a collision. If Ashley turns the bid down, the fans who contribute could be several hundred thousand pounds down in “adminstration fees” plus the interest on £10 million ‘proof of funds’ (corporate financiers getting paid even if the bid fails as you write). Anyway, what’s this 10% proof of funds thing about anyway? Wasn’t it 100%? The fans won’t be too pleased and it will ramp up tension even higher. It could end up as blackmail. What if they make a derisory bid and say “or else it’s war” too? Things will get even worse. ok batty we’ll forget about your previous posts…everything is cushdy m8. It was even worse Batty was pretending it wasnt him. These kinds of things have to be very detailed as you write, there has to be a whole prospectus. what a character wor batty is haha…youv’e got to love him. komfart stardust b@ll@cks i swear on me daughters life it wasent me can u stardy? I assume the 10% is to cover the admin and legal costs etc, which will need to be paid whether it falls on it’s ar*e or not? Not that I have the faintest idea what sort of costs might be involved or whether it’s justified. I’m just gathering that may be one explanation? T_F – I think someone else mentioned the format, unless it was you originally. How is this more difficult just purely in terms of commenting? Isn’t it almost identical? Worky – theres a days writing as to why the whole thing stinks. They are portraying it as an investment, which in itself they can not approach people who do not have a certain net worth or “sophisticated investors” – but sophisticated investors are not going to chuck away 20k – so they look to the ordinary Joe to rob his piggy bank and take his money for their own betterment…Strange how they’ve now moved the investment down to ordinary Joe levels! Thats why they pre-released a press release to get people to come to them – they never had the 20m in the first place – put it this way – they needed 1000 people to invest 20k to get that – anyone know any folk who have stumped it up? So now they look to ordinary Joe, they will take their “deposits” (not proof of funds) and use this as investments grow to leverage – its as bad as it gets. Its almost a crime – shocking. Worky – with .com closing – is it worth putting up a code of conduct or something? Just we could do with Batty getting banned ASAP. Tommy Smith would have sh*te himself! It’s 5% of the 10% ‘proof of funds deposit, Bowburn. If the price is £100 million, 10% of that is 10 million obviously, and 5% of 10 million is £500,000, plus there will be interest accruing on £10 million in a high interest Escrow account too, that’s what they say. So where does that go? And, who decided that 10% was proof of 100% suddenly? Mike Ashley? Keith Harris? And as Stardust rightly points out, where are the full financial details? Are they going to publish some kind of prospectus? because they should have done that already. This just isn’t going like the proposed purchase of a £100 million pound football club. Before people put a significant amount of money in, they have a right to know the full picture. Seriously though, they may not feel ‘tired’ but it’s about a professional athlete being at their peak at the right time. Even very fit young lads have peaks and troughs and it’s a very small difference. You’ve got to be at your peak, even in the Championship. As I wrote before, players who are worked very hard are more likely to get injured too, and we both know what injuries are like at Newcastle. What happened? I thought Ed was closing down on Sunday? I was going to leave a nice farewell and good luck message. Looks like I’m another refugee from Eds .com then, recognise a few names so far and I’ve just joined!!!!!!!! I think it was quite apt Batty – remember – the last person the murdered man saw – was his murderer – you stood over him with a knife in your hand – then deny you killed him. I wasn’t right about Keegan, batty. I didn’t think he was suing for £25 million and I told you that once, and I thought he didn’t have a great chance of winning his case either. I didn’t count on Ashley’s legal team being so crap though, I thought with all his money he’d get a good one! Nothing to do with me Batty – it was the adverts and Uziblogging. He had people jumping from thread to thread and there was no flow to the posts. But we have to be grateful – he put a lot of effort in – only to be threatened by you – you bully. Someone was sending HUGE spam comments in the name of Ed Harrison here too. They came from a server in in the centre of Tripoli in Libya. You can do all kinds of things if you have the right knowledge and the right tools batty. Worky > I didn’t count on Ashley’s legal team being so crap though, I thought with all his money he’d get a good one! Ha Ha just shows money cant buy you everything lol. Worky you have something good going here mate dont let WUM’s Kill it mate. Well Lads the end is now the last of the Edlines. Onto Carroll – the thread lol – for me for a big lad – he is a terrible header of a ball – he whips his neck around – and the ball can pop off anywhere. Shearer on the other hand relied on the simple head it back past where the keeper just came from – opposite corner – worked 90% of the times. Sloped off since FFS’s bid dint materialise. No doubt about it Batty – he had been an advisor to FFS at a certain point in time. How he could defend that scumbag I will never know. I mean its like defending you lol. Never batty! But I have to design and run websites, so I have to know about that sort of thing, Ed should too. I get hundreds, if not thousands of spam messages in my e.mails every day. Im off now anyway. I didn’t go to bed for one minute last night! Stardust did you allways use a capital S ? Yeah I did Dave – I had a user name before Eds log in system but it was that long ago I cant remember what it was lol. Stardust was given to me by Troy when we were out in town. We went into the casino and as we signed in he burst out laughing and told everyone I had introduced myself as Keith Stardust – International Entrepreneur lol (just to be clear I hadnt lol). Stardust kinds stuck with a few of the lads after that lol – so here I am. I see someones been faking me on here ! Keith Stardust lol, No it was just I thought I noticed before that on a couple of times that your name was lower case ? im near 100% sure. But then you do have a lot of stalkers ;) batty being the No 1 and your mate Troy must be No2 lol. Im sure that pee’s you off and batty aswell when wums use your username. So who is investing in this “yes we can”? My gran was born not far away from Sir Bob, and she is more than happy go give me the cash to invest, but not sure if its going to work, i could pay off some of my car with that sort of cash!! Not one person would invest without knowing what they were getting into unless they were philanthropists …………. i never used ed’s bog but it seems some were using it as a public convenience .